On the first Monday after the Supreme Court’s decision on the Patient Protection and Affordable Care Act, a half-dozen UC Berkeley experts in constitutional law, public policy, economics, and health law and policy rendered their judgments on the ruling during a panel discussion sponsored by the Goldman School of Public Policy and the Robert Wood Johnson Scholars in Health Policy Research Program. 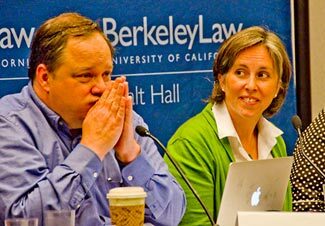 Healthcare economics, the challenges of implementing a complex law about which the public is deeply divided and the powerful role of politics were all put under the X-ray, during the discussion held at Berkeley Law. Constitutional-law expert Jesse Choper said that one of the most significant implications of the high-court ruling is in limiting Congress’s power to “make all laws which shall be necessary and proper” for executing its enumerated powers. “It’s the first time in 100 years that the court has put an important limitation on the ‘necessary and proper’ clause,” he said. Several panelists gave a nod to the law’s potential to significantly expand access to healthcare. But “whether or not the expanded coverage is going to be affordable in the long run, that is the central question now,” said Stephen Shortell, dean of public health. The U.S. spends 18 percent of its GDP on healthcare, Shortell noted, “twice as much other countries that have better health statistics than we do.” And given our aging population and our technology-laden healthcare system, “this legislation will not reduce costs.” It could, however, help to slow the rate of growth for healthcare spending, he said. All this sorely needed reorganization of healthcare delivery [begs the question of] the underlying physical and social determinants of our health. Tell me where you live — or where you lived in your developing years — and I can pretty accurately predict your current and future health status and your life expectancy. “‘Obamacare’ is ‘Romneycare,’ ” said Brad DeLong, a political economist and influential blogger. As such, the federal law and the Massachusetts law share the same weaknesses, he said — including the absence of a public option and “handing a lot of market power to near monopolies,” in remote areas especially. Health law expert Ann O’Leary said the Supreme Court, in last week’s 5-4 decision, may have found the law, in the main, constitutional, but wondered about the “political will” to implement it vigorously, even in blue states like California feeling the strain of healthcare costs. Proponents of the reform law intended it to provide healthcare coverage for 32 million of the 50 million medically uninsured, she noted — 17 million of them (largely low-income single men) via expansion of Medicaid coverage. Now the Medicaid expansion has been declared optional, and many states — including Texas and Florida — are threatening not to participate. Video of the event will be posted shortly on the UC Berkeley YouTube channel, as well as on UCTV Prime. Audio of the forum can be found on Brad DeLong’s blog.